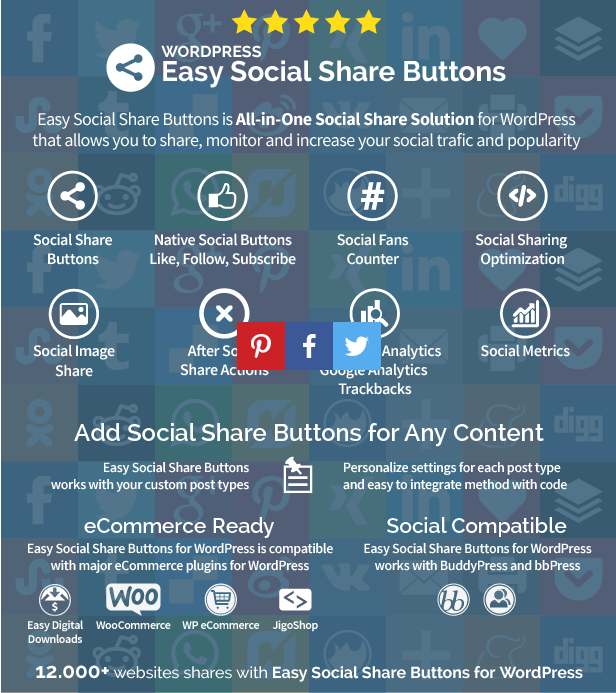 Easy Social Share Buttons for WordPress comes equipped with 19 different themes. At this section have to be chosen default theme that will be used. Please choose from the list the template you would like to use. For every single post/page can be set custom theme in its settings box (see on post/page settings). Flip – makes the button spin fast. These two options improve website’s loading speed. It’s recommended to switch them on. BUT if you use any cache plugin, there is no need to activate them. The cache plugin is enough. This option is made specially for W3 Total Cache. If you use this plugin, it’s recommended to activate it to prevent issues with counters. This feature is related with data base loading, when W3 Total Cache is used. This option is designed for websites with non Latin letters in domain name or url address. It refers mainly to Chinese, Japanese, Hebrew and Arabic. INPORTANT Activate this option ONLY if you have any problem with social sharing. Do not take this as a default option. The first thing you have to do in this section is to choose from the list social networks that would like to display. With drag and drop rearrange them to complete the order you prefer them to appear. If you tick off More Button on social networks list you will receive button with plus on it at your buttons on posts/pages. All networks marked as active located after More Button will appear on your screen when click on + button. This function provides great variety of social networks without any “crowd” effect. Display all social networks as pop up – click on +button will appear all social networks after more button in the list below in pop up window. There is no matter if they are marked with thick. Display only active networks as pop up – click on +button will appear in pop up window only marked networks after more button in the list below. IMPORTANT If you have activated a lot of social networks the buttons will try to fit in the hover and they will lap over one other. Also individual share counts will not display correctly with this option activated. Full width share buttons width correction (number) – type a number from 1 to 100 to correct width of the buttons so they can fit in the content area. More buttons available require small number. There is no ready formula to work here. Play with numbers to find the right one. Full width share buttons width correction mobile (number) – same as option above but dedicated for mobile. Max width of buttons in full width display mode – here can be set custom with for buttons to be displayed to ensure enough empty space for total counter or custom share message. For example if the empty content area is 100 you can set 90 in this field and you can activate total counter without any display issues. Twitter share short url – this will make Twitter shared link shorter. it’s recommended to activate this option because Twitter has symbol limitation when share link. If you have activated global option for share short url skip short url section. Please note that if you have start sharing your full address this will reset counters to zero because address will be different than address you have already used. bit.ly – require valid bit.ly username and API key (API key is located in your profile of bit.ly). Twitter username to be mentioned – fill the name that wish to be mentioned when tweet. Enter the username without @. This text will be appended to tweet message at the end. IMPORTANT Please note that if you activate custom share address option this will be added to custom share message. Add Twitter username to buffer shares – this option will add Twitter username into Buffer shares. Twitter hashtags to be added – if you wish hashtags to be mention in tweet you can add them here, if more than one separate with comma. Don’t use popup window for Tweeter Share – if you have another instance of twitter tweet button on your site this may cause to display it twice or reload page without opening tweet window. Activate this option to fix this issue. Make Twitter always count full post/page address when using shorurl – if you have switched on short url when starting work with Easy Social Share Buttons but you want to restore the Twitter count number when sharing with full address, turn on this option. Use Facebook Advanced Sharing – According to latest changes of Facebook API previous existing methods for custom sharing with options are removed. To customize your share message you can do this with current page Open Graph tags or by activating Use Facebook Advanced Sharing. Facebook Advanced Sharing requires to have created Facebook Application which is used for sharing the message. After creating it you need to write Application ID in Facebook Application ID field. Facebook Application ID – is needed to be activated when you use custom share message. Applications are specific for current site so if you don’t have application for current site go to http://developers.facebook.com/apps/ and create a new one. Display Facebook Total Count – this option will include in total count number all Facebook activities – likes, shares, comments. Do not generate shortlinks – mark to turn off the shortlinks. It’s recommended to activate this if you use StumbleUpon. This network do not accept shortlinks. User prindfriendly.com service instead of default print function – if you activate this option your site will be print optimized. When you print content it will be well formatted to fit at print area. Activate Google Analytics Tracking – this option allows to keep an eye on social share statistic on Google Analytics – how many times every button is clicked on every page. Extended – gives track clicks for every single activated social network by button position. You can examine users behaviour on sidebar followers widget, particular article, post, page. Add Custom Campaign parameters to your URLs – helps to inspect the effectiveness on social networks of every campaign. If you want to know how many times every share from any campaign is reached on Facebook for example, it’s necessary to fill in here your custom campaign parameters. Look here how to generate them. Default share image – paste here address of a image that want to be used when the post doesn’t have featured image or any other custom setting for share image. It’s recommended this image to be upload on site where share will be done, otherwise it’s possible this image do not appear in share dialogue. Extract full content when generating description – When you use any plugin or shortcode for content building – for example Visual Composer or Drop cap, these plugins leave traces at the code. And if you want to clear the content from any extra code, activate this option. Automatically generate and insert open graph meta tags for post/pages – will insert at your website data base meta tags. These are specific types of information about your social sharing which gives you the opportunity to optimize and control the process of sharing information. Otherwise social networks will take content as they decide to. IMPORTANT If you use any other plugin which activated meta tags on your website do not turn on this option. More than once activated tags has the same effect as they aren’t activated at all. Other plugins with meta tags are: SEO plugins, social media optimization plugins. Facebook Admins – this will connect website with particular account at Facebook that guarantee uniqueness of shared content. IMPORTANT It’s necessary to paste personal account ID. Enter your Facebook profile page, look at the address bar you will see something like https://www.facebook.com/profile.php?id=xxxxxxxxxxxxxxx. The numbers at the end at the address are your ID. Facebook Application ID – this is necessary to activate Facebook Insights. You can find your Application ID at https://developers.facebook.com/apps. Under each aplication you have created you can find App ID. Automatically generate and insert Twitter Cards meta tags for post/pages – this option will allow to customize tweet information. Under every tweet it will be displayed predefined description and image. It require Twitter verification before start working. IMPORTANT At Twitter there is no default tweet description. If you want the have any description activate Twitter Cards meta tags. Twitter Site Username – tape here your Twitter username without @ in front of it. This username will be added at the end of the description. Summary with image – both text and image at the description. Google Authorship is no longer supported. To improve search results Google now use Rich snippets. At upcoming update the latest G+ changes will be included. Activate social privacy – This option is connected with the privacy of personal information of the users. Activating this option no information is shared without user’s permitting it. If you activate this option the native buttons will display like this. Load Facebook API asynchronous – it’s recommended to tick off this to avoid site load slow down. First field – for width correction. First try with 100 and depends on result increase or reduce the number to fit the output. Second field – for height correction. Third field – to move up the button higher and line all native buttons. Skinned button width replace – Use this field if after customizing social button don’t display full. Standard width is 80 px. Privacy button text – tape here the text displayed when switch on Activate social privacy option. This text is visible when the button is not pushed from the user. Privacy button width replace – use when the privacy text is not display full. LinkedIn Company ID – paste here your LinkedIn Company ID. This option will make your Like button share custom page. For example your Facebook profile. Data refresh time – choose at what period the information will be refreshed. IMPORTANT A lower value will use more server resources. High values are recommended for blogs with over 500 posts. Choose update provider – Choose default metrics update provider. IMPORTANT shatercount.com service works faster but sometimes it’s overloaded and the result returned is zero. The second method with call to each social network. It’s a little bit slower, but works flawlessly. Drag and drop the items from the list to order the networks to display at Social Fans Counter. Cache Time – set the time period for refreshing the counters. 24 hours is the optimal time length. Type – choose the type of the connection you want to make – with user or channel. If you mark user at the field above you have to fill username. If you mark here channel you have to fill your channel ID at previous field. Click On “Register a new App” Button. Enter your App Name, your Blog URL and Description. Then click on “Register Your App”. Copy the “API KEY / CLIENT ID” and paste it in “API Key” input field in the Behance Box. Press the button Manage Clients to register a new client (button Register Client). Fill the form – for Website and OAuth redirect_uri enter your site or http://localhost. Text Below The Number – default text is Loves. You can customize it at any language. APP Secret – get your Secret Key from OAuth Keys as it is described above. Button URL Address – paste address to be loaded after click on Comments counters button. This can be page with list of users or any other page from your site or even other. Image selector – in this field you can add your CSS class to customize on which images to get the buttons over. .essbis_site img – this CSS will make the buttons appear on all images on your site – even in the sidebar, header, footer or other visual elements of your site that you which to be shareable. In some WP themes featured image is displayed before the post content and this CSS is necessary to be added to make feature image share work proper. IMPORTANT – If you activate URL Shortener, you will get completely new addresses for pages and posts. This will make your share counters start from zero. After Social Share Actions allows you to encourage user to perform additional action after a content is shared (example: like us or follows us after share, display subscrbe form and etc.). Please note that after social share actions module is not compatible with social privacy when like/follow after share is active. Display type – choose the number of columns that social buttons will appear. Custom Share Message allows to customize message, URL, image and description for all the buttons available on your site. The demo site of the Easy Social Share Buttons is example how this option works – all the buttons share the URL of product page on codecanyon.net with exactly the same description and image no matter which social share button you press. Activate custom share message – activate this option to allow usage of custom share message. Advanced Custom Share option allows you to set custom share information for every single network. As you see all the networks support different elements for customization, so for each network there is different number fields available for filling up. If you customize share information for any network this information will be shared every time no matter from what page on the site the button is pressed. IMPORTANT Setting parameters for social network will have highest priority for custom sharing and will overwrite settings from custom share message option. Customize E-mail Message section will help you to customize text displayed when visitors share your content by mail button. Message subject – write here the subject of the mail message. Paste your site URL between the signs for percentage as it’s shown by default in the field – this will make it display as link. Message body – write custom mail message text. IMPORTANT Do not make any changes at this part of the text – %%title%% and %%permalink%%. It is set automatically to get the title and the address of the page from which the user send the mail message. If you want to add the featured image to the mail message add this %%image%% in the field. Use wpMandrill for send mail – To be able to send messages with wpMandrill you need to have plugin installed. The Optimization Options section will help you optimize the loading speed, when the website is very visited or when you want to reach fast load. The loading optimization refers only for the Easy Social Share Buttons way of work. Fix counter problem with limited cURL configuration – activate this option if have troubles displaying counters for networks that does not have native access to counter API (ex: Google). To make it work you also need to activate in Display Settings -> Counters to load with WordPress admin ajax function. You can turn off build in modules that you do not use. This will make plugin to work faster. You can turn back on modules at any time. Deactivate plugin on – paste in the field page IDs where you do not want buttons to be displayed. Do not load button resources on homepage – if you hide the buttons from the homepage with this option, the buttons do not load at all for homepage. So there is no way to display the buttons there with no scripts and etc. For bbPress, BuddyPress, WP e-Commerce, JigoShop there are some extra display settings available. Activate sidebar as additional display method – thick off to activate sidebar as additional display method. This option will allow you to display buttons as sidebar in combination with selected as default display method. Activate Popup as additional display method – thick off to activate popup as additional display method. This option will allow you to display buttons as popup in combination with selected as default display method. Activate Post Vertical Float Sidebar as additional display method – thick off to activate Post Vertical Float Sidebar as additional display method. This option will allow you to display buttons as Post Vertical Float in combination with selected as default display method. Activate Flyin as additional display method – thick off to activate Flyin as additional display method. This option will allow you to display buttons as Flyin in combination with selected as default display method. In this section you can set the network names and the counters easier and faster. The idea of this quick set mode for names and counters is to choose what result you are looking for. All the settings necessary the buttons to display that way will be made automatically. This will save you to wonder what combination of options you have to activate to get the finale outlook you wish to reach. Also using Easy set you will prevent activating options that are with opposite action which may cause troubles in proper button’s work. Quick settings apply for button style – choose from the list button style. Example button style preview will help you to make your right choice. Hide Social Network Names – choose yes if you want social network names to be hidden. This will display only social network icon by default and network name will appear when you hover button as it is shown at the picture under the option. Always hide network names on mobile – this option will hide network names when mobile device is detected and only social icons will be displayed. Don’t show network names when hide social network names is activated – this option will disable network name pop out when you activate Hide Social Network Names and only button with icon will be displayed. IMPORTANT! This option is activated by default on mobile devices and can’t be turned off. Don’t show network icons – This option will display only network name inside button without icon. IMPORTANT! This option must not be used with hidden network names or counter position inside as the button will have no proper display. Social Network Names – in the field in front of every social network you can write custom text that will appear instead of network names inside buttons. Cache internal counters (Mail, Print, Love and no API counters) – if you are using mail, print or love button and your site is with high traffic, it is prefered to activate this option. This option will decrease server load because in the time between two calls the counter will give back the number from the cache. By default it is set cache time to be 600 (that means 600 seconds). If you want to correct this time period use the field below. If you do not write nothing there this option will work with 600 seconds cache period. Activate internal counters for all networks that does not support API count – Weibo, Tumblr, Digg, Flattr, WhatsApp, Meneame do not support API count and when you want to diplay counters for this networks you have to activate this option. It is set to count the number of clicks by the plugin itself for every page/post. Load counters with build-in WordPress AJAX functions (using admin-ajax) (recommended) – this option is used to display share counters with WordPress build in functions. This method is more secure than the default one. By default the plugin is using external file to reach the counters but it do not allow cache of the counters. Some hosting companies do not work with this default method, because of its secure disadvantages. In this cases and also when you have high loaded website or would like to activate cache for the counters you need to activate this function. At this option there is field where you can set time period (in seconds) for new call to APIs. This option will decrease server load because in the time between two calls the counter will give back the number from the cache. Display button counter after this value of shares is reached – write in the field number after which the share counters will be visible. While the numbers are smaller than this filled in here, you won’t be able to see share counters at your site. Hide total counter when display counter of sharing is active – this option will make total counter to be always hidden while share counters for every network are active. Append text to total counter when big number styles are active – activate this option to customize the text below, when big number styles are active. Write the text in the field – for example shares, likes. You can add texts at any languages. Display total counter after this value of shares is reached – write in the field number after which the total counters will be visible. While the number is smaller than this filled in here, you won’t be able to see total counters at your site. Change default display method for mobile – choose from the list another display method of buttons which will be applied when page/post is viewed from mobile device. Display only those buttons for this button position – mark with thick the networks that you wish to appear only for this button position. If network is selected this will overwrite default selected networks and display only selected here. At all the personal messages in this section may be used %%title%% and %%permalink%% to include the title of the post/article or its address. You just have to paste this code variables without any changes where you want to have the relevant element available. Message above share buttons – write in the field custom text that you want to display above the share buttons. The content here can be as long as you wish. The only thing you have to weigh in mind is your page layout and the empty space above the buttons. Message above like buttons – write in the field custom text that you want to display above the like buttons. Set custom top of float bar – write in the field number to set from what point from top the buttons will be rendered. Set custom top of float bar for logged in users – write in the field number to set from what point from top the buttons will be rendered for logged in WordPress panel user only. If you have set 40 for custom top of float bar, you have to add 32 to 40. 32 px is the height of the WordPress admin bar. This value for float from top will be active only for logged in users. Background color of float bar – this option gives you the opportunity to customize the background color of the buttons. Set full width of float bar – tick off to activate full with for the float from top. This will make buttons to take full width of browser window. Sidebar appearance – choose from the list where sidebar to be positioned. Automatically close popup after (sec) – set time period after which the popup will be closed. Display popup window after (sec) – set time period after which the popup to be visible on the screen. Display popup window after percent of content is viewed – write after what percentage of page content viewed the popup to be visible. Window will automatically close in message customize – customize at your language the message for automatic close window. Horizontal offset from content – if the default offset value do not fit with the your page content and overlap it, you can correct this from here. Negative number will move the Post Vertical Float Sidebar on the left. Positive numbers will move the sidebar on the right. Vertical offset from content start – with this option you can move the Float Sidebar up or down depends on your page layout. With this setting you can locate Float Sidebar exactly at the same line as the content starts. Fixed top position of float bar – this option will help you when you use any specific theme features as too big header or slider at the beginning of the page. In this cases there is possibility the buttons to lap over this elements if Vertical offset from content start is activated. Use Fixed top position of float bar to set offset from the upper side of the window. The buttons will display at this point initially for all pages on the website. Flyin window width – here you can customize the default width of the window. The default width is 400 px. If the width of the screen is smaller than these 400 px, automatically the width of the popup is reduced with 60 px. The same reduction is valid for the value you set here. Automatically close flyin after (sec) – set time period after which the popup will be closed. Display flyin window after (sec) – set time period after which the popup to be visible on the screen. Display flyin window after percent of content is viewed – write after what percentage of page content viewed the popup to be visible. After user close window do not show it again on this page/post for him – activate this option to prevent popup to display more than once for this user in the next seven days for this page/post. After user close window do not show it again on all pages/posts for him – activate this option to prevent popup to display more than once for this user in the next seven days for all the pages/posts. Flyin window close button text – set custom text for popup window close button. You can use any language. Any other post type as page, media, forums, topics, replies, products or other used on your WordPress installation will be set in same way. Full width share buttons – choose whether to activate full width for Bottom of content buttons. IMPORTANT! Activating this option will make your buttons to take all the width of your working window. The width of buttons depends on their count – when you have a few buttons width will be greater than when you have more active buttons. Full width share buttons width correction – write number between 1 and 100 in percents to correct the width of the button itself. For example if the buttons displayed are more and are too close each other write here small percentage number (50) to make them smaller and fit in the window width. And the opposite, if the buttons are fewer and the space between them is big, fill in here number close to 100. This will make them locate closer each other. Rename displayed texts for network names – use this option to customize the text for every button that will appear instead of the network name. You can use this to translate network names on your language. For all other button positions Top of content, Float from content, Window sidebar, Popup, Like buttons top, Share buttons bottom, Share buttons top, Like buttons bottom, Post vertical float bar, Content Inline and Flyin Panel the buttons can be set with exactly the same options. Use this part of the options to customize the colors for all the social networks. You can change background color, text color, hover color, hover text color by color code paste or by the color palette. Remove effects applied from theme on hover – use this option to remove the hover effects that your WordPress theme use. Facebook background color, Facebook text color, Facebook hover color, Facebook hover text color – set these options by color code paste or by the color palette. Facebook icon – paste here url of the image which you want to set as Facebook icon. Upload the image at your WordPress library first and get the address of the image from there. Facebook icon background size – write here number if you want to correct the size of the Facebook icon. For example enter here 30 px to make the icon 30px width and 30px high or 30px 20px to make the icon 30px width and 20px high. You can make the button smaller too if you need so. You just have to keep the rule that the first number is setting the width and the second is for the high. It’s useful if you have set big buttons with CSS, because gives opportunity to make the icons bigger too and the final look will be better. Facebook on hover icon – paste here url of the image which you want to set as Facebook on hover icon. Upload the image at your WordPress library first and get the address of the image from there. Facebook on hover icon background size – this option works analogous to Facebook icon background size but refer to on hover mode. For all other social networks color customization can be set exactly the same as on Facebook. All the networks in the list can be color customized by color code paste or by the color palette. Fans counter has two types of templates – background and white icon or color icon only. So depends on the template chosen color change will have an effect on button color or background color. Write here any CSS you need to customize the social buttons or any other element from your site, whenever it is related with this plugin or not. When you make your choice by one click start to fill the settings. Social Networks – choose from the list the networks you want to add by shortcode. You can reorder them by drag and drop. Hide network names – choose to hide network names, hide and display them on hover or do not hide them. Full width share buttons – tick off to arrange the buttons on full window width. The width of buttons when this option is activated depends on their count – when you have a few buttons their width will be greater than when you have more active buttons. Full width share buttons single element width correction – write number between 1 and 100 in percents to correct the width of the button itself. For example if the buttons displayed are more and are too close each other write here small percentage number (50) to make them smaller and fit in the window width. And the opposite, if the buttons are fewer and the space between them is big, fill in here number close to 100. This will make them locate closer each other. Fixed width share buttons – activate this to make possible customizing width of the buttons. Choose alignment of network name when fixed width is used – choose from the list alignment for network names. This setting will affect and counters too when Position inside or Inside name options are activated. Template – choose from the list template for the buttons activated with this shortcode only. IMPORTANT! If you do not choose anything from the list the template of your shortcode buttons will be as default set. So if you want to generate shortcode with buttons at the same template options as these you have already made on your site, just do not make any choice here. Social Network Names – use the field in this option to customize the default share text for each network. You can use any language. 1. 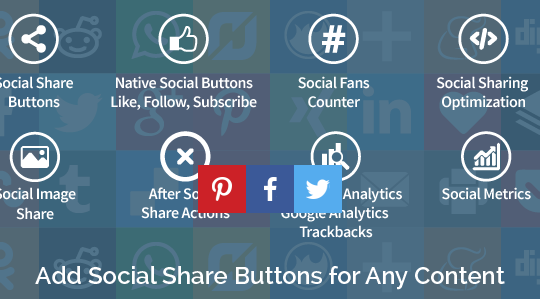 The first code will help you to display social share buttons anywhere on your site. Implement the shortcode with copy/paste at the Edit Post Page of the page where you would like to display the buttons with this shortcode. If you have been chosen Sidebar, Pop up or Post Vertical Float display methods when generating the shortcode paste the code at the bottom of the page content. 2. The second code will help you to add the shortcode at your WordPress theme. Insert this code into the template where you wish the buttons with this shortcode to be displayed. For example if you paste this shortcode into footer template file the buttons set with this code will display only there. If you paste this shortcode into posts template file the buttons will display on each page marked as post page type. 3. The last two codes will help you to put the current post/page title and permalink (the full address of the post) into your shortcode. The most common situation you may need this codes is when you want to share the address of particular post when it is part of some kind of post list as resent posts for example. And when press any share button from this post list there will be shared the page address and the title of the each article itself. If you do not use these codes the buttons would share the url of the page where this post list is located, no matter the buttons refer to particular article from this list. How these 3. codes are used? You have to paste this two row code at any template file on you WordPress installation where you wish the buttons display by the shortcode prepared with Shortcode Generator. Insert it into the template, where you wish the buttons with this shortcode to be displayed. Width of button – write here a number to fix if the button is hidden on half. This option is used to make correction when you had already get your shortcode and you can see this issue with the button display. Depends on the WordPress theme and the language used this number will be different. So to get the number you need just get a try, there is no other way to hit it. Skinned button text overlay – write here a text that will be visible, when Skinned Native Buttons is activated (the option is at the bottom of the option page). This text will be visible on the screen and on hover will display the Like button. For example you can write here Like Us and on the page where you implement the shortcode this text will be visible. When you position the cursor on it Facebook Like button will display. Skinned button width – write here a number to set custom Facebook Like button width, when Skinned Native Buttons are activated (at the bottom of this option page). Correction would be necessary if on your language the text you set do not fit on the button. The width by default is 80 px. All the settings for FACEBOOK FOLLOW BUTTON, TWITTER FOLLOW BUTTON, TWITTER TWEET BUTTON, GOOGLE +1 BUTTON, GOOGLE FOLLOW BUTTON, YOUTUBE CHANNEL SUBSCRIBE, PINTEREST PIN BUTTON, PINTEREST FOLLOW BUTTON are almost the same as described above. The differences with minor and depends on every network features. Skinned Native Buttons – tick off this option to activate Skinned Native Buttons. 1. The first code will help you to display native buttons anywhere on your site. Implement the shortcode with copy/paste at the Edit Post Page of the page where you would like to display the buttons with this shortcode. 3. The last two codes will help you to put the current post/page title and permalink (the full address of the post) into your shortcode. You may need this codes when you have native buttons added with shortcode to any post list (as resent posts for example) and you want Like or Follow action to refer the url of the article itself (not the url of the all post list). IMPORTANT! It’s important to say that these codes are not very useful in the native buttons situation. The reason is that the native buttons add too much code to particular page and this would overload the page. So if the loading speed is important thing for you, it is not recommending to set your native buttons shortcode that way. The shortcode below is necessary to be used only when you want the title of the article to be part of the native social action, when this article is part of any list. The only situation that the article’s title is part of the native social action is Tweeter Tweet Message for now. Insert this code into the template, where you wish the native buttons with this shortcode to be displayed. For more detailed information how to use 3. codes please have a look at the end of this article. Message before the total counter – write here a text that will display before the number of shares. For example: Shares or Total. Custom URL to extract total counter for – if you want the total counter to show the shares for some other page than this where it is displayed, paste here the URL of the other page. Align – choose were to locate the total counter number at your site – left, right or center. Text for shares after the number – write here a text that will display after the number of shares. For example: Shares or Total. Display full number (not short syntax) – tick off if you wish your total counter to display the full syntax number. Select Social Networks – choose the networks witch shares you wish to include in your total share number. 1. The first code will help you to display total share number anywhere on your site. Implement the shortcode with copy/paste at the Edit Post Page of the page where you would like to display the total counter with this shortcode. 2. The second code will help you to add the shortcode at your WordPress theme. Insert this code into the template where you wish the total counter to be displayed. The most common situation that this code is used is at any kind of article lists. 3. The last code $url = get_permalink($post->ID); will help you to make your total counter refer for each particular article, when this articles are part of some kind of list – for example Most popular. How to use 3. code? Insert this code into the template, where you wish the the total counter to be displayed. Click Statistics provides statistic information about how many clicks are done on each group buttons by social network. The information is collected locally, so there is no guarantee that this numbers are real shares on the networks. The numbers in this statistic shows how many clicks have been done on buttons for each network, but there is chance sharing window to be closed from the user. In this case there is a click, bit there is no share. Please keep this on mind! Overall social share stats since function is activated shows all the clicks for every social networks buttons since the plugin is activated for the first time on your WordPress installation. If for some reason the plugin is deactivated or even uninstalled, when you upload it again on this WordPress installation, this data will be still available. The new clicks will be supplemented to the previous numbers. Social activity for the last 30 days shows all in one diagram statistic for the last 30 days day by day. This is total click counter for every day shares for the last mount. Social activity by months shows table statistic by months and social networks from the first activation of the plugin on your WordPress installation. Leading posts in social actions shows all networks clicks statistic for all the posts at your site. As you can see at the picture above that the information is available even for posts that are removed (the page/post column is empty). The posts are sort by clicks leading. At the standard view you see Top 20 posts, when you press Full content report button you will get statistic table for all the posts on your website. If you want to have a closer look at the clicks mount by mount, go to Social activity by months and just click the mount you would like to inspect. You will get Activity by date of month chart and Content details for this month. Activity by date of month shows all in one chart statistic for the last 30 days day by day. This is total click counter for every day shares for the particular mount. Content details for this month shows all networks clicks statistic for all the posts at your site. The statistic is sorted for the particular month. Configuration String – if you press the Backup button you will get in the field the settings, you have made till now at he ESSB. At the same field you can paste settings that are ready. The most common situation this feature is useful is to get the button settings you have done at your developer site version and paste it at your official one. This option gives the opportunity to try with different settings, to test the way of work and when the desired visual and functional display is reached to copy/paste settings as data base code from one WordPress installation to another. Available configurations – at this section there are list of ready made configurations. With one click on the name of the particular configuration you can make it available on your site. You can check the display look and functionality for each configuration on Easy Social Share Buttons demo site. IMPORTANT! Please note that if you click on one of the configuration this will automatically make all the settings necessary to display the buttons the way that this configuration style provide. That mean that all the settings done till now will be cleared! Purchase Code – paste here your purchase code and this will ensure you automatic updates. Quick Set and Fix Menu Bar is located under the Main operation setting panel. As it is seen from its name this part of the menu panel is created to help you to set your buttons fast without any specific skills necessary and also fix quick and easy possible working troubles of the buttons.